The closest hotel to the Grotto, the Grand Hotel Moderne is the ideal base for pilgrims looking to be as close as possible to the most important spiritual sights of Lourdes. The hotel is within a short walking distance to Our Lady of Lourdes Shrine, the Sanctuaries, the baths of healing waters, the evening’s rosary and candlelight procession, the Basilique du Rosaire et de l'Immaculée Conception, and the Basilique St-Pie-X. Such is the privileged location of Grand Hotel Moderne, that from many of its balconies one can enjoy the views and sounds of the evening’s rosary and candlelight procession. Tarbes-Lourdes: 15 km (about 25 minutes drive). Taxi fare: around 30 € - 40 €. Pau-Uzein: 60 km (about 55 minutes drive). Taxi fare: around 80 € - 110 €. Toulouse: 180km (about 2 hours drive). Taxi fare: around 280 € during the day, 360 € at night. The town's train station is served by SNCF and TGV trains, including some that provide overnight 'sleeper' services. The journey from Paris to Lourdes by train lasts 5.5 hours by TGV high speed trains. From Toulouse to Lourdes by train takes 2 hours. Highway A64-E80 (Toulouse-Bayonne) - Exit n° 12 (Tarbes Sud-Lourdes). Turn left on road N21 and follow signs toward Lourdes. 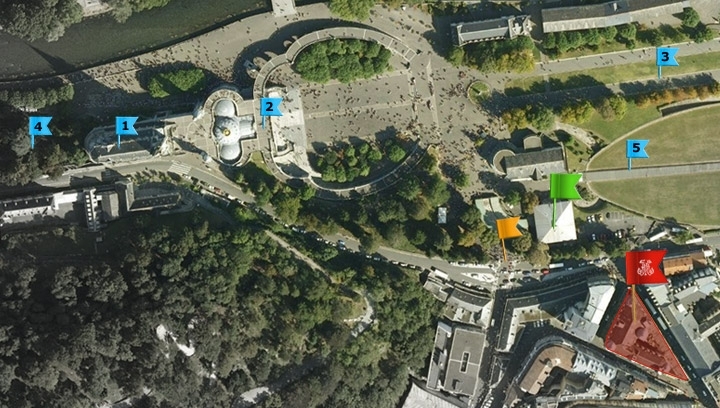 Arriving in Lourdes, follow signs indicating "La Grotte" (the Grotto). Our establishment is located 30 m from the Saint-Joseph gate on the left side of the sanctuaries when you are facing the Basilica. Our hotel is located just nearby (1 minute walk) the municipal parking station with 400 car spaces and Merlasse Place with 40 car spaces. Parking costs €14 per day/night. Our front desk is at your disposition to organize taxi transfers. on this website are owned by Grand Hotel Moderne.